Courtesy of the publisher, I'm hosting a giveaway of a copy of Infinityglass plus an Infinityglass poster! Just leave a comment by next Tuesday at midnight to enter. 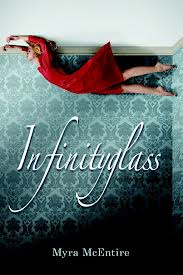 Infinityglass (Edgmont, August 2013) is the third books of Myra McEntire's Hourglass trilogy--romantic suspense involving a power struggle over the control of paranormal abilities, including time travel. In a nutshell, the discovery that some people have genetically determined supranatural talents has led to a conflict between various powerful individuals over control and profit. And the teenagers who have the abilities, all drawn together by chance, or by the manipulation of their pasts, struggle to make sense of the secrets, lies, and plots that are shaping their lives, so as to make sure that the manipulation of time does not threaten their chance of a future. Each book in the trilogy focuses on a different pair of teenagers, who must learn to work together and trust each other, while struggling to thwart dangers, ultimately falling into true love. In a sense, all the tensions of the larger plot (the murders, the various bad guy characters, the hopping in and out of time) are sort of a static-y surround for this romantic focus--I, at any rate, ended each book with a much clearer understanding of the characters' relationships than I did of what the heck was actually happening in the bigger picture (this could be my failing as a reader). This third book focuses on Dune, protégée of the Hourglass Institute (the good guys), who can manipulate water with his mind. When he was a kid, he unwittingly used his ability to bring a tidal wave crashing into his Samoan island home...killing, among others, his own father. Now a geeky, handsome teenager, he stays as far from the ocean as possible, so going to New Orleans on a mission for the institute wasn't what he really wanted to do....But he is the one who knows the most about the Infinityglass, the legendary key to time travel, so off he goes. The Infinityglass is no artifact, though--it's a living person. A teenaged-girl named Hallie, whose father is basically a mob boss getting rich from the time travel retrieval of priceless artifacts. Hallie is essentially imprisoned by her protective father (he has reason to keep her locked-up, as she is his one vulnerability, and plenty of people hate him), but now her powers as the Infinityglass are awakening...and her father's house can no longer hold her. Dune has been installed as her bodyguard, though Hallie and her father both know why he's really there. Dune and Hallie, forced together by circumstances, fall in love while danger swirls around them. That is not all that sets her apart. As the Infinityglass, she can transfer one person's power to another, and this makes her a most desirable weapon. One the bad guys want, more than somewhat. As I said before, the focus of this book, and the previous two, is the relationship between the two central characters. So this is a series I'd recommend to the reader who loves romance with a paranormal twist (things get quite steamy between Hallie and Dune), not so much one I'd recommend to the reader of Time Travel. That being said, the paranormal elements do add an intriguing backdrop for the romance, with pleasingly high stakes (even if I wasn't always sure I was remembering enough from book 1 to make sense of them). I love how these books always have teens working together to overcome problems - it's truly a valuable lesson for teens today. I'd love to have the book and poster for my YA section in our library. We're teeny tiny! I liked the cover of the first book in the series, but now I think the designer is overreaching. I'll pass on the opportunity to win because I wasn't thrilled with the first one, but thanks for reviewing. I've read the first book of this series, and I'm really excited to see how the trilogy wraps up! I haven't read this series but it is definitely on my TBR shelf. Thanks for the great giveaway! I love that book cover! It's so interesting! The cover looks amazing and the books sounds good :) Thank you for the giveaway! I enjoyed Hourglass. I really need to catch up on this series!